Wunderkammer was a finalist for Foreword Reviews’ 2014 INDIEFAB Book of the Year Award in Poetry. Deep inside the primordial forest. And filled, at birth, with a green ocean of terror. "…a collection that’s both mordantly funny and delightfully hopeless, as Cruz’s imagination roams between several nebenwelts (side-worlds) while indulging itself in fineries and miseries galore.” Read the full review. "The power of Wunderkammer lies in the sheer gorgeousness of language combined with leaps of imagination and fearless psychic revelation. Cruz chooses beautiful sounds for terrible things, layering assonance in the book’s opening poem, for example— 'Was found drowned in a cream velvet/Mini gown…'— and playfully rhyming 'guillotine' with 'dream' and 'coconut cream' in the final Nebenwelt. Her poems have a wry sense of humor that tempers the traumas they reveal." Read the full review. “Cynthia Cruz executes a formal innovation on a scale not seen since Pound and Williams attempted to get the 20th century into a poem. She offers an expanded conception of the poem as a Neo-Expressionist art object. 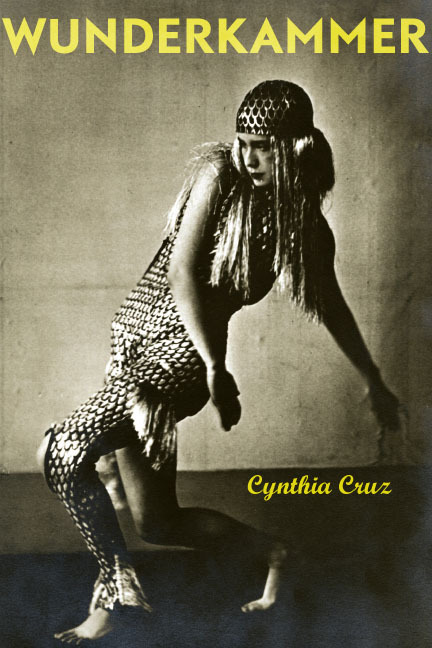 The poems in Cynthia Cruz’s Wunderkammer show her to be a cosmopolitan force in the 21st century art of American poetry." Read the full review. "I find Cruz’s poetry spellbinding because it permits darkness to exist with nuance, to be both debilitating and sacred. This darkness—which seems to be inescapable given the colossal interiority of these poems—permeates everything, and yet is not shown to be necessarily sinister. Nor does Cruz glorify depression, drug abuse, anorexia, or any of the other conditions that give rise to the half-submerged consciousness that marks so much of her work." Read the full review. "The meanings of entire worlds and lives are broken down into exquisite musical lines and repeated mentions of white horses, pulses, snow, sequins, cakes, creams, diamonds, emeralds, and palanquins. Existence and the memories of existence are told in the 'embellishing, collecting, then/deconstructing' of lives and objects. Cruz takes our world and all possible worlds and collects, embellishes, and displays them as in a Wunderkammer, to be explored by the living and animated by the 'sweet bloody hum of the impossible animal,' until we reach a nebenwelt, an afterlife, or just some velvet morning." Read the full review. "If the speakers are dragged into this ‘next world’ or ‘Neberwelt,’ then so, too, is the reader, who finds himself standing amidst Cruz’s glorious piles of trash and relics, perhaps even struggling with the question of what to do with them all. Appreciation for this collection hinges on the reader’s ability to widen the lens, to play along with the larger game of the wunderkammer itself, the beautiful junkyard into which we have been invited." Read the full review. "Just as Renaissance cabinets of curiosity were more than simple warehouses for artifacts, Wunderkammer exists as more than a collection of poems — this book is a rarity, an art object, an installation piece drawn from the mind of Cynthia Cruz, who renders her haunting other-world through its labyrinths and beyond, fearlessly." Read the full review.